Just Contemporary Romance: Celebrating the Fourth of…February? Congratulations to "Sherry H.", the winner in Barbara's giveaway. Thank you to all who participated! 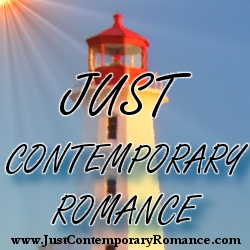 Thanks to Just Contemporary Romance for inviting me back here to chat! I hope all those of you who celebrate it had a wonderful Fourth of…July. Yes, that’s right, July. When it comes to dates, I always have to stop and think twice. Recently, my husband asked why he’s suddenly seeing calendars in every room of the house. There’s a wall calendar hanging in our kitchen, an appointment book on the coffee table, a one-dollar engagement calendar tucked between the reading material in the “reading” room, and a page-a-day calendar block on the corner of my desk. I explained to him it’s because I’m a writer. Which means I never know what day…or month…or sometimes even what season we’re in. In May, I was plotting a new series that takes place over Christmas and New Year’s. That’s not so bad, is it? To get into a holiday mood, you can always drink a mug of hot chocolate, heat water and some spices in a pot on the back burner of the stove, and crank up the Christmas tunes. In February, I turned in final edits on my upcoming book, which begins in July—and comes out in August. :) Getting into a summer frame of mind isn’t quite as easy when you’re wearing flannel p.j.s and curled up on the couch with an afghan. Keeping track of the seasons is only the beginning! Since my books revolve around family, there are lots of characters and their special dates to remember—anniversaries and birthdays, ages of each of my hero’s nieces and nephews, the day school ends for the summer, my pregnant heroine’s appointments with her doctor and the stages of her baby’s development. Also, in small towns, the townsfolk are very big on community. (And on keeping track of everyone else’s business! LOL) They wouldn’t take kindly to an error in the dates of the annual Founder’s Day Festival or a mix-up over which night the local café serves their meatloaf special. Now you see why I need all those calendars and why I sometimes don’t know what day it is. I’m always looking for ways to help me stay organized in my personal life, too. Have you got a calendar/to-do system that works for you or any tips to share? Unable to meet Luke’s eyes, Carly pushed a stray olive around on her plate with a fork and inhaled an uneven breath. She couldn't handle seeing that unexpected touch of vulnerability in his face. She didn't want to dwell on what had happened in his life once he'd walked away from her. Most of all, she couldn't bear even to think about his grief over the wife he had lost or his love for the little girl he shared with that other woman. To her relief, Kim finally returned to the table, bringing the napkins she'd supposedly needed. To her even greater relief, Luke grabbed his plate and cup. "Take my seat," he said. "I've got to be getting home." He nodded at them both. Watching him walk away set off a familiar ache in the pit of her stomach. Kim slid into the seat Luke had left. Carly welcomed the distraction, though Kim's eyes already held questions. She would want to know what she'd missed. Understandable since, right from the beginning, Carly had always shared with her best friend everything that happened between her and Luke. She shrugged. Under cover of the talk all around them, she lowered her voice and reported, "He sat. He ate. He departed. That was the extent of our big reunion, and that's all it's ever going to be." "Come on, Carly, you can't be immune to the guy. He's twice as hot as he was when you went with him." "And any interest I had in Luke Nobel cooled to sub-zero temperatures back then. It's not like he meant a lot to me, anyhow," she fibbed. "You know I only went out with him in the first place to try to get my dad off my back." Kim sighed. "Well, I'm sorry it didn't turn into the romance of the century." But how could she tell Kim the truth? She couldn't explain, even to own satisfaction, why she had suddenly felt the need to keep Luke all to herself. Instead, she had sworn Kim to silence. Still, typical teen that she was back then, she couldn't keep from sharing developments with her best friend. Day by day, she had filled in every little detail of her first big romance...until the part where she and Luke slept together. Hope you enjoyed the clip! 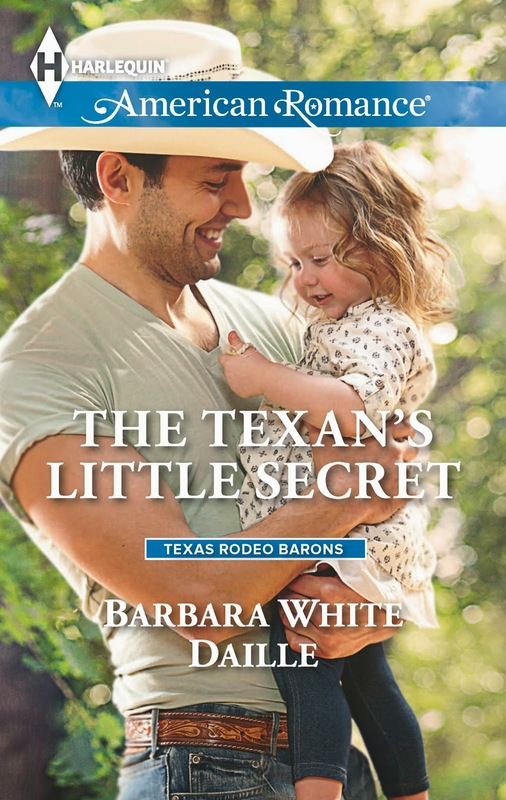 I’m giving away books, including an autographed copy of The Texan’s Little Secret. Check out the Rafflecopter below. Coming home might be the worst decision Carly Baron has ever made. Each minute on her family's busy ranch is one minute closer to seeing him—her first love—the man who broke her heart seven years ago. While coming face-to-face with Luke Nobel again brings back painful memories, Carly quickly realizes there are other strong feelings just under the surface…. Luke would be a lot better off if Carly had stayed away. Being a single dad to an adorable two-year-old girl and managing the Roughneck is tough enough, but resisting the sparks that fly whenever he and Carly are together is near impossible. But first she must tell him her secret. The truth could heal their past…or forever destroy their chances of becoming a family. Originally from the East Coast, award-winning author Barbara White Daille now lives with her husband in the warm, sunny Southwest, where they love the lizards in the front yard but could do without the scorpions in the bathroom. Barbara writes romances—usually with cowboys, kids, and a touch of humor. Her current title is Rancher at Risk, and she’s excited that her upcoming book, The Texan’s Little Secret, releases in less than a month! See giveaway details below. US and Canada postal addresses only. I use BirthdayAlarm online for email reminders about birthday and anniversaries, but I don't have suggestions for other types of occasions. Good luck. Thanks again to JCR for inviting me to visit. Readers, I'm looking forward to chatting with you and learning some new time-management ideas. Marcy - that sounds like a good solution for special dates, and a great reminder for folks who are on the run to stop and pick up cards. I like email remainders as well as the google calendar function so I can send appointments to my husband. As our family is growing, we have more and more appointments and committments to keep track off. I also love to do lists. As for FB, that's a good tip for birthday reminders, too! I don't use the google calendar but do send email reminders through my provider. It really does help keep things in the front of your mind, doesn't it? I have so many reminders/calendars, Barbara! I need visual cues! I have friends/family birthdays/anniversaries noted on my daily calendar (as I print a day per binder page every year, then write what happened each day in detail - including my self-employed customer info - on those pages, as I refer to those pages years and years later). It is also handy having those dates saved in Word, as I can go to my computer and type in someone's name in order to find out just when their anniversary or birthday is (although I also have a handwritten list in case my computer crashes). I have a one-page yearly listing of birthdays/anniversaries for those people I actually send cards to, and I refer to it often. I note dates a week or more in advance so that I can buy new cards, if necessary. In my kitchen, I have crates with hanging file folders on them: January through December. When the kids were small, I used to have 1-31 also. So each morning (and now the 1st of each month only), I would go through what was in those folders. (Anything later in the month gets noted on my fridge calendar.) For example, I organize a street yard sale every year, so I keep the advertisements and Mastercraft apron under May. I keep a sheet under December to remind me to write down my car mileage for income tax purposes on Dec 31 each year. I remind myself to wash a brown-sugar softener every three months, run my dishwasher and washing machine every six months with vinegar, ScotchGard my furniture every six months, etc. I use a regular wall calendar and have never forgotten a birthday or any other special day. I usually purchase a day/month planner and write my appointments and scheduled events in it. I keep it on my desk and check it every morning. Some of the important dates I put on my phone as a reminder alert . Even thought a computer was supposed to cut down on paper, leaflets and such, I find I come in contact with a lot of paper. For time mangement purposes, I handle each one as I get it only one time-if it needs filing, I do it then. If it needs tossing, I do it then. If I need to read it, I do not lay it down thinking I will read later. Handle it only once is my motto. I put a calendar in the kitchen and each year I write down the birthdays and age and anniversaries and years. on the appropriate date. That way I do not forget anyone. I have a day planner I use to keep me on track. I keep notes and a calendar around for my to do stuff... I still manage to forget the occasional thing though, lol. i have 2 calendars, 1 on eaither a desk or hanging on my wall and the other is on my fridge. I have a calendar in the kitchen that I write in all events as well as one in my handbag. I also keep all doctors and dentist appt. cards just in case they don't have a record of my appt. Penney - thanks so much, and you're very welcome. We owe big thanks to Maureen, too, for hosting the blog. Laney4 - oh my gosh, you're organized! I love so many of those tips. The search function is definitely my friend when I need to find something in a manuscript. Now I'll have to try it for other uses, too. Thanks for sharing - I'm sure many others will find a tip or two that's helpful. I have a pocket calendar for my bag, a wall calendar in my room and another full calendar for my assignments. I also have a desk calendar for backup with all appointments and assignments. I tend to write everything down, which makes my calendars very messy...which leads to the multitude of calendars, lists, etc. I'm loving all these tips! I hope newcomers are reading through the comments to find ideas that work for them, too. I don't want to rush through replies, and I'm also on deadline, so expect me to be popping in a few times the rest of today, and then in and out over the next few days. Will definitely respond to everyone. Each year I buy two special day planner calendars...one for my desk and one for my purse. On January 1st, before I throw the old one away, I transfer all important info to the new calendars (birthdays, yearly events, notes, phone/email list, etc). In the back, I put a copy of any event invitations that I plan to attend. Then no matter where I am I always have one source where I can get the info I need. quickly. I'm mainly a list maker, all kinds of lists! Today's list: grocery shopping! Joye - my dh and I laugh all the time over the idea of computers cutting down on paper. Yes, they help a lot in some ways, but in other ways they're more of a hindrance - in my opinion, anyhow. I'm always either printing things so I can sit at the dining room table or curl up on the couch with them, or else I'm printing "just in case" - since I've had frustrating computer problems and have lost work in the past. I definitely could cut down on the number of times I handle junk mail and filing, though. Of course, then all the papers UNDER the magnets would have to find a home! Linda - and I'll bet that day planner is easily transportable to go anywhere with you. I really need to streamline my systems! Nancy - that's a great reason for keeping the cards for the appointments. I never thought about that use for them - though I do try to keep the cards with me when I'm on the way to the appointment, in case I run into trouble and have to call them. Argh! So...I'm typing along and my computer freezes up. Anonymous - your system sounds a bit like mine, right down to the backups. I do all that transferring over at the beginning of the year, too. Some years this happens closer to New Year's Day than others, but at least it does get done. Pat - that's definitely an important list. Do you have a certain day for doing your grocery list? I know doing certain jobs on certain days helps some people stay organized. The topics of time-management and organization could go on forever, couldn't they? RW - I hear you! We're sort of in the same boat. I think I need to go back and re-read some of the great tips we've seen here so far. Great way to be to plan your schedule and time is to have a planner and to be a bit selfish with your time. I have a problems where my time is split between my family, my mother, and me. I just don't have enough of me time until I start learning to be a bit selfish so I can get my personal errands completed. That's a good point, Kai. So many of us are pulled in so many directions, it's hard to find focus enough to plan. But I think everyone benefits when we can feel a little more in control of our own lives. Thank you to everyone who stopped by and left a comment and/or entered the giveaway. I enjoyed reading all your tips. Sherry - please get in touch through the Contact form at my website. Thanks, and congrats!